A vital 3 points on the road today, particularly with Norwich and Leeds being held to a point each on their travels. It always sounded like we had a bit more in the engine and the only suprise was that it took until the 73rd minute to get a second when it should have easily come before the break, although like the end of the second period we did do our best impression of a wobbly jelly. It was Scott Wagstaff who scored the winner sending the ball into the net to relief all around after a pass from the Mooney, who sounded as if he carried a threat all game. 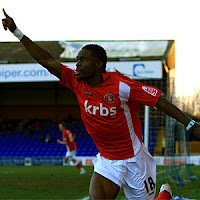 In the first half Sam Sodje headed us in front from a pinpoint Basey corner and I must admit at that point I had visions of another Trannymere, but the home side short on confidence made a good fist of it. It was a shame not to keep a clean sheet and I have no idea what materialised at the end but Robbie Elliot was credited with an own goal. For me the CAFCTV radio commentary is a godsend but Radio London's Emma is absolutely flippin useless. She is fully two or three seconds behind play and one has to listen to the crowd noise to work out what the hell is going on. She literally will say nothing for ten seconds while she either sips on her Horlicks or broods over what next to say. It's a football match, fast paced, not ruddy crown green bowling. The last few minutes were not enjoyable but my pacing around was only multiplied by Emma who did not have bloody clue what was going on. Despite all around her County fans celebrating, it finally dawned on her that Stockport had scored and only in her match report later did she note that Carl Baker was sent off in the melee at the end. Sorry, but I do feel better now and I'm going to savour another 3 points on a day where for once other results went for us. Save journey home Addicks.